Raphaël Élizé was an early 20th century French politician and the first black mayor of a metropolitan town in France: Sablé-sur-Sarthe (Sarthe). 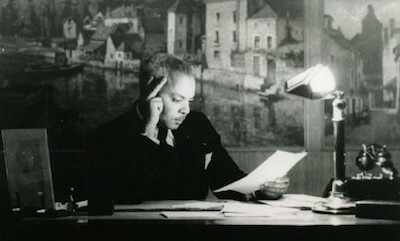 He was born in 1911 in Martinique into a racially mixed family: Augustin, his father, a tax collector and active Freemason, and his mother, Jeanne, had eight children. In 1902, the family who lived in Saint-Pierre moved to Fort-de-France just before the Mount Pelée explosion. As Saint-Pierre refugees they resettled in France. Raphaël was 11 when he entered the French school system. He attended the best high schools in Paris (Lycée Montaigne and Saint-Louis) where he completed his studies and then enrolled in veterinary school in Lyons, graduating in the summer of 1914 just before the beginning of World War I.
Twenty-three-year-old Élizé joined a colonial infantry regiment, first as private and then he was later assigned as the regiment’s veterinarian. During the war he received the Croix de Guerre. In 1919 Élizé married Caroline Hayotte who was from the same mixed-race community in Martinique. Shortly afterwards the couple moved to Sablé-sur-Sarthe, a cattle and horse producing region that at the time had no veterinarian. They eventually had one daughter, Jeanne, who died in 1938. At the time they were the only blacks in the town. Élizé, however, joined the farmer’s association, was a board member of the saving bank, and presided over the local veterans association. He also developed a reputation as a classic music lover and a local photographer with his own darkroom. Élizé joined the socialist party (SFIO) in 1924. Five years later in 1929 he was elected mayor of Sablé making him the first black office holder in France in modern times. It was a particularly important achievement because Sablé was in a conservative and Catholic region. As mayor Élizé worked hard to modernize Sablé. He led the town in creating its first kindergarten, a community center, a public soccer field, and the first public swimming pool west of Paris. In 1935 Élizé returned to Martinique as the representative of the French Association of Mayors. He was there for the 300th anniversary celebration of Martinique’s link to France. While in Martinique he traveled back to his birth city, Saint Pierre, where he was welcomed by the mayor, Maxence Élizé, who was one of his brothers. When France entered World War II in 1939, Élizé was mobilized into the army as a veterinarian with the rank of captain. After the fall of France to Nazi Germany on June 22, 1940, Élizé returned to Sablé but was removed from the office of mayor by the German Army which now occupied the town. In 1943 he entered the Resistance network to gather information about the Nazis and French collaborators. Élizé was arrested by the Nazis in November 1943 and sent to prison first in France and then to the Buchenwald Concentration Camp in east-central Germany in January 1944. One year later, on February 9, 1945, he was killed by an allied bomb during a bombing raid. The public square facing the town hall in Sablé was named after Élizé in 1946. A second public square in Le Mans was named after him in 2011. In 2013 the French government issued a stamp to honor his memory. M. Agulhon, L. Girard, and J. Robert, Les maires en France du consulat à nos jours (Paris : Publications de la Sorbonne, 1986); Simple Passé, Raphaël Élizé (1891-1945) Premier maire de couleur de la France métropolitaine. Des Antilles au Maine: Itinéraire entre politique et art de vivre (Paris : Éditions du Petit Pavé, 2010). art de vivre (Paris : Éditions du Petit Pavé, 2010).